Explain what a Quick Send message is. Name the types of Quick Send message recipients. Send a Quick Send message. Now that you know how to use campaigns to send a series of related messages to your customers, what about those instances when you just need to quickly send one message to your customer? You can open your email inbox and type up a personal message, but it would lack that branded experience your customer expects, and chances are you’ve written dozens of the same email with only minor modifications. Plus, if you need to share a lot of information, it takes time to draft, review, edit, review, and send—only to find you included an embarrassing typo. What if there’s a better way? Good news! Quick Send in Distributed Marketing is uniquely designed for you to send a single, branded and compliant message—and still personalize it for the recipient. Quick Send is especially useful for email content that is vetted by a legal or marketing department for compliance and branding. 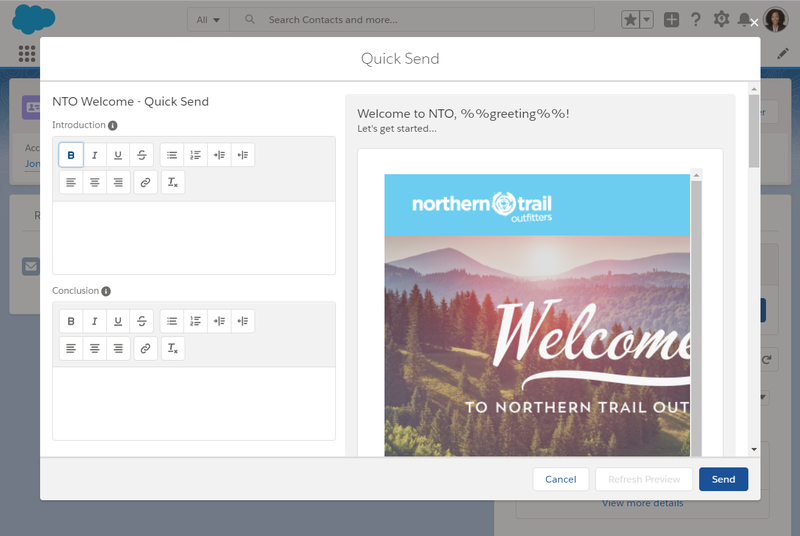 Your Distributed Marketing administrator configures Quick Send for your use. The administrator adds the Quick Send Lightning component to pages and enables single-send journeys for use in Quick Send. After the Distributed Marketing administrator enables messages for Quick Send, you can send individual messages directly from a contact, lead, or person account record. Navigate to a contact lead or person account record. In the Quick Send Messages component, click in the Message search field and select a message. To personalize and send the message, click . The message editor and a preview of the message appears. Did you select the wrong message? No problem! Just close the window and select a different message. Here’s your opportunity to add a personal message to your customer. Click Refresh Preview at any time to preview your custom text. When you’re ready to send the message, click Send. Check out this Distributed Marketing: Quick Send video that shows how easy it is to use Quick Send. You learned the importance of a personalized customer experience and how Distributed Marketing makes that easy. We explored the differences between campaign sends and Quick Send—and how to use each. Now it’s time for you to create an unforgettable customer experience with the power of Distributed Marketing!